Kerry's debate lift continues today as a new ARG poll in New Hampshire breaks the tie there and puts him ahead there 49% to 45%. The MoE is 4%, so this should still be considered a statistical tie. The few other state polls don't show much movement. On the state graphs, the lookback window for the regression lines has been dropped to 30 days on the grounds that July and August polls really don't matter much any more. The old version included polls taken before the DNC. Even going to 60 days would include polls from BEFORE the RNC. I can't believe they have any relevance at all, except for states like California and Texas where there is no doubt about the results. The predicted graph is still there, but you have to work for it. It is at www.electoral-vote.com/fin/oct18p.html today, at oct19p.html tomorrow etc. There is no bookmarkable page for it, to discourage its use. Again, I wouldn't put much stock in the 'predicted' map. The current map is a better predictor this late in the game. Slate summarizes the national polls, state polls and some typical survey questions like "Is the country on the right track or wrong track?" Slate does not have the most recent polls for AR, CA, GA, LA, NV, NM, OH, OK, PA, SD, VT, VA, WV, and WI, but it still has a lot of useful information. But even if you use all the most recent polls, the problem of cell-phone-only users keeps coming up, as discussed in The Hill. The Los Angeles Times has a story on polling too. It points out, as most experts already know, that an incumbent president rarely gets even more than 1% of the popular vote than the final polls show. If an incumbent is polling, 47%, 48% just before the election, that is probably what he will get. In contrast, the challenger always does much better than the final polls indicate. I get a lot of e-mail asking why the electoral college score given here doesn't always agree exactly with other websites' score. There are several reasons. First, we may use different methodologies (e.g., most recent poll vs. an average of the past three polls). Second, some sites reject pollsters they consider unreliable (e.g. Strategic Vision). I use them all unless they get caught push polling. Third, it sometimes happens that somebody simply misses a recent poll. It is a lot of work to try to get them all, believe me. Even excellent sites such as 2.004k.com are sometimes a day or two behind. Fourth, not every site subscribes to every data source. PollingReport.com costs $195 a year and The Hotline costs $6000 a year, for example. 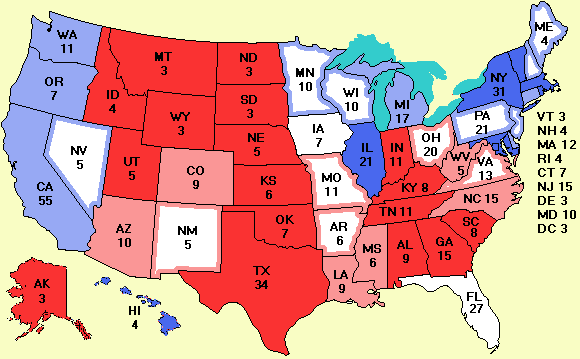 As an aside on methodology, the list of "New polls" under the map refers to those states in which the most recent poll (the one on the spreadsheet) changed today. When a poll is released that is older than the current one, it goes into the Polling data file, but is not included in the list under the map. Rasmussen has a nice rundown of the competitive Senate races. There has been a lot of talk about the military service records of John Kerry and George Bush. Here is a list of the service records of a number of other leading public figures. The military service records of all 43 presidents is listed here. Campaign 2008: I always believe in getting an early start so I have registered the email address votemaster08@yahoo.com (but who knows if I will use it). Here is a bit of 2008 campaign news. Jeb Bush has stated he will not run for president in 2008. This opens the path for Neil Bush and Marvin Bush because the twins, Jenna and Barbara, won't be old enough to run in 2008. Finally, there was another attack Friday, but we seem to have done better this time. As a precaution against future attacks, I have installed a fourth server. If you can't get through to www.electoral-vote.com, try www.electoral-vote2.com, www.electoral-vote3.com, and www.electoral-vote4.com in that order. The main one is far more powerful than the others and has multiple fiber-optic connections to the Internet. It is also updated first, so please use only www.electoral-vote.com unless it is not working. Another alternative in case of an attack is the RSS feed, which is much harder to attack. I would be interested in getting a one or two more backups for emergency use in case of future attacks. I have had some volunteers, but it is hard to tell if they are friend or foe. That kind offer from sneaky-joe@unknown-company.com might be from one of the attackers, who wants to run a server with doctored data. I thought of a simple filter that will probably reduce this problem to a minimum. The server should be in the .edu domain (NOT .com or .net) and the contact person should be a tenured professor. Senior faculty members tend to have a long paper trail and would be risking their careers by attacking a political website or monkeying with the data. Since there is hardly any time left, I basically want a clone of the current servers to make sure everything works the first time. The required configuration is a Pentium 4 or Pentium III with 512 MB RAM or more, at least 1 GB of available disk space, and a connection to the Internet capable of serving 500,000 small files an hour. The software should be UNIX, BSD, or Linux (NOT Windows or Mac OS X) running Apache and a couple of other things I will tell potential sites privately. Also needed is an experienced system administrator who has earned his spurs dealing with large-scale attacks. BEFORE making an offer, please check with your local system administrator about the configuration, capacity, and hackproofness.